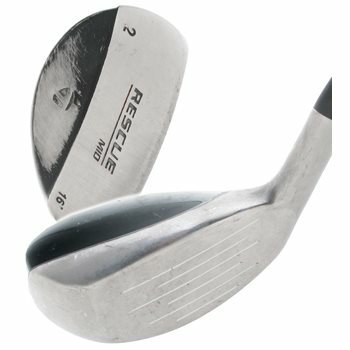 The TaylorMade Rescue Mid is considerably larger than the original Rescue club The additional size and deeper center of gravity make it very easy to hit high and land softly on the green. Combines high launch angles and high spin-rates for high-flying, quick-stopping approach shots, resulting in maximum accuracy. The midsized, low-profile head allows for a low and deep center of gravity, providing high, penetrating launch angles. Replaces hard-to-hit long irons, lowering your overall score.